On our second day in Munich, we embarked on a bus tour of the city with our group. We passed by a number of different areas around the city, including the Olympic parks and the BMW headquarters and museum. Our guide gave us a bit of background about the population and lifestyle. Most people on the bus were shocked to see young elementary school children biking to school on their own in such a big city. We got off the bus to explore a bit of Schloss Nymphenburg, the summer residence of past royalty. 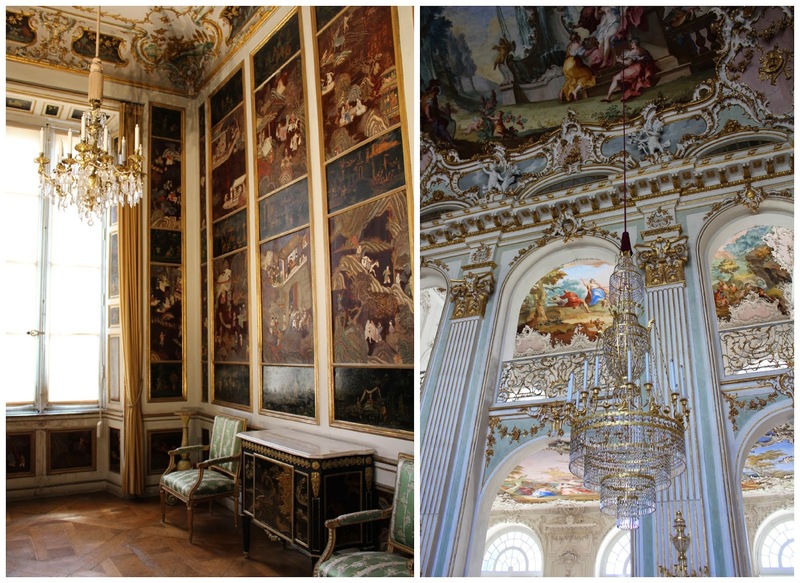 It was beautiful, with very ornate rooms. I wish we had more time to explore the grounds, as there were other building beyond what we were able to see. The frescos of Roman gods were some of my favorites, as there was definitely intention behind the way they were depicted. We then made it to Marienplatz in time to watch the Glockenspiel chime at 5pm. It was a neat spectacle to see the life-size pieces in motion, but I incorrectly assumed it was older than it was; it dates to 1908. For supper, we ate at celebrity German chef Alfons Schuhbeck's Orlando. I had Schuhbeck's currywurst and an Augustiner Helles beer. The food was tasty. We sat outside to enjoy the atmosphere and people-watching, but it was a bit annoying that a group of teens at the table next to us started to smoke. Sigh. On our way back to the hotel, we walked from Marienplatz to Odeonplatz, where we passed by the Feldherrnhalle (honoring Bavarian veterans) and Theatinerkirche. I was bummed the church was covered in scaffolding, because the color is so unique. All in all, a very pretty journey through the city! Thanks, Krista! I think one of my favorite things about Europe is its age... I just really love taking a step back in time there. That said, some of the things I saw this trip were more "modern" as in 1800s, so it really highlights the differences between the US and Europe too. It was a fun time! We had the most beautiful weather too. 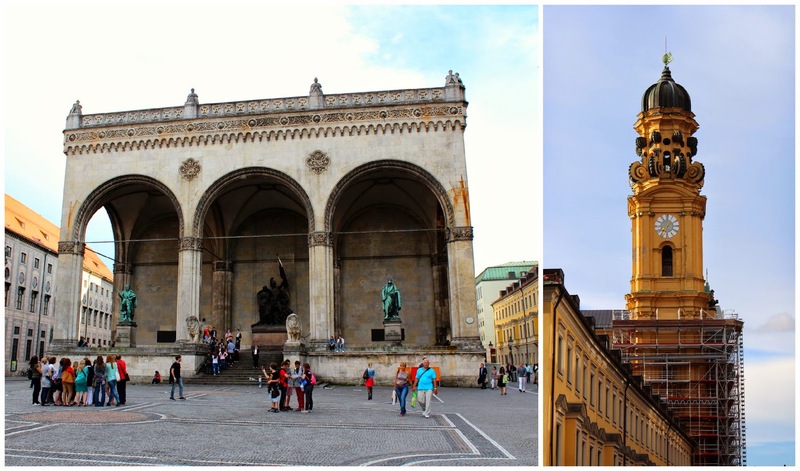 Some of my favorite Munich sites! The majority of the glockenspiel was actually rebuilt after WWII, or that's what I was told. Supposedly German cities were given the option to rebuild modern ways or rebuild in the classic style and Munich rebuilt in the classic architecture. We ate at a restaurant right across the square from the glockenspiel and watched it chime. It was amazing. I could watch it all the time. Nymphenburg is one of the few palaces I would love to go tour again. We only had a few hours there and we didn't get to spend any time in the gardens. It was interesting to see how they rebuilt after WWII. I can't imagine how much history and beauty was lost in bombings.